Note: You must be an ARCRA member and logged on the the website to access the full primer. Who is in the American Red Cross pension plan? The American Red Cross began its defined-benefit plan in 1936. As of spring, 2017, according to American Red Cross National Headquarters staff, there are 18,600 retirees, or survivors of retirees, taking pension benefits. There are another 9,500 members of the pension system who are not yet taking benefits. About 9,000 former employees gave up their pension rights in exchange for a one-time lump sum payment, in buyouts that were offered in 2013 and 2016. Like many large employers in current times, Red Cross has moved away from its defined-benefit pension plan, in favor of a 401(k) defined-contribution program. The pension fund was closed to new employees in 2009, and for current employees, it was frozen in 2012 – that is, no more contributions were made, and no additional pension benefits accrued. So today, except for investment income, all of the funds in the pension plan flow outward to retirees; there is no longer a stream of regular employer contributions to the plan. Even though the fund has been closed to new employees, and frozen for current employees, the fund will be around for a long time. Red Cross National Headquarters officials project that the fund will be paying out benefits through 2077! In addition to the defined-benefit plan, and on the defined-contributions side, there are about 25,100 Red Cross employees or retirees with a 401(k) balance. Within the past few days, many ARC retirees have received letters describing changes in the way that their pension benefit will be paid beginning September 30. The American Red Cross Retiree Association board has been briefed on these changes and has made plans to help our members and other retirees understand these changes beginning with this initial communication. If you will be affected, it is most important to note that the American Red Cross has pledged that “there will be no changes to the gross amount or timing of your monthly pension payment.” If you do not receive a letter from the Red Cross, your benefit will continue to be paid in the same way. It is also important that you read the materials carefully, respond to any requests, and make use of the phone numbers and email addresses provided as needed. If you get help from a family member or other advisor with your financial business, get the materials in front of them promptly. The Red Cross has purchased a new group annuity contract from Athene Annuity and Life Company to honor obligations to pension recipients whose monthly gross payments from the Retirement System portion of your benefit are $500 or less and who began receiving benefits on or before July 1, 2016. In addition, pension recipients whose benefit has been partially backed by Aetna and John Hancock annuities purchased in 1989 will begin receiving two direct deposits or checks each month, one from Athene and one from either Aetna, John Hancock, or from the State Street Bank on behalf of the Red Cross Retirement System. Alight Solutions (formerly Aon Hewitt) will continue to support administration of Red Cross benefits. Red Cross pension benefits are currently insured by the Pension Benefit Guaranty Corporation (PBGC). Going forward, the portion of your benefit paid by the annuity contracts will be backed by State Guarantee Associations. We will provide more info on State Guarantee Associations in future communications. Though the timing of when your monthly pension benefit is issued will not change, if you will be receiving two payments which add up to your current benefit, it is possible that your direct deposits will not be posted on the exact same day; however in most cases it should. Likewise, your checks may not arrive in the mail on the exact same day. If you become concerned after receiving the first direct deposit or check, we’d urge you to wait a day or so before calling the appropriate support number. We suspect that many pension recipients are unaware that benefits earned prior to 1989 have been covered by John Hancock or Aetna annuities though they have been combined with benefits earned after 1989 and paid through the State Street Bank in a single check or direct deposit. Though your gross total benefit may be greater than $500 per month, the portion actually coming from the Retirement System may be less than this if any portion of your total benefit has been covered by these 1989 annuities. If you fall into this category, your total pension benefit will now come directly from Athene and John Hancock or Aetna. As indicated in the letters, Red Cross has concluded that purchasing the new annuity contract and changing the way in which the existing annuity contracts pay other pension recipients is the best way to secure pension benefits for current recipients, maintain a healthy plan for future retirees, and focus financial resources on the mission. Insurance company annuities are common and typically sound, but as with any major financial institution, there are always pros and cons to be found. In our preliminary research, however, we have found that insurance companies which hold the pension obligations for organizations like the ARC have excellent track records. For example, although many may be unaware, retirees who have been receiving pension benefits and were employed in 1989 or earlier are receiving a portion of their benefit from John Hancock or Aetna, paid through the ARC. If you have questions after reviewing the Athene Welcome Packet, call them at 1-877-8134240. Direct calls to Alight (formerly Aon Hewitt): 1-877-860-7526 regarding the portion of your benefit still being paid by the Red Cross Pension Plan through the State Street Bank. Alight will also continue to provide customer support for the Red Cross Savings Plan 401(k), retiree health insurance and other benefits. Regardless of the source of your pension benefit, ARCRA will continue to advocate for all Red Cross retirees and educate our members on important and relevant issues. Given the impending changes, our research and education efforts will now include pensions backed by annuity contracts and the State Guaranty Associations which insure them and be communicated through our monthly eNewsletters, print newsletter The Retiree, and website. In addition, we’ll continue to help retirees to stay connected. Our ability to continue this work depends on the continued support of our members. It’s summer and the American Red Cross Blood Services depends on people like us to help during traditional shortage periods—not just by donating blood, but by giving our time, money, and expertise. Maybe you’re interested in lending your time to assist staff and donors at a blood drive. Maybe you’ve got a knack for getting people involved. Whatever your passion or area of expertise, you can share your time and talents with the Red Cross this summer. You've probably seen the words "fiduciary rule" in the news and may have wondered what all the fuss is about. Answer: it's about us--America's retirees and future retirees--and the investment advice we're counting on to keep our nest eggs safe and growing. A fiduciary is a person who is bound to act for another's benefit. Sounds simple, but in the world of finance it can be complicated. Those of us with retirement savings in IRAs, 403(b)s, 401(k)s and other tax-sheltered accounts have usually selected these investments on the advice of someone. Maybe it was a stockbroker at one of the well known brokerage houses; maybe it was a banker; or maybe it was an independent financial advisor. We assume that all these people are acting in our interest when they recommend an investment. But are they? Again, it's complicated. In the money management world true fiduciaries are legally pledged to act in your best interest and can be held to a very high standard in this regard. For example, if they recommend investments that are unsuitable for you, or that carry very high sales charges compared to similar investments, you have the right to take them to task, and even take them to court. On the other hand, money managers who are not fiduciaries are only pledged to recommend investments that are "roughly suitable" for you. They are free to steer you to funds that will pay them high commissions or that might not be the absolute best for you. And they're not required to consider the widest choice of investment options in making their recommendations. In other words, their loyalties can be conflicted. Yes, of course they want happy customers, but they often have their own financial interest in mind as well when they suggest an investment. However, Acosta also said that even though the rule will take effect in early June it will not be enforced until the new year, and that public comments will continue to be reviewed as the executive order demanded. This means that while the rule will technically be in force as of June 9, its future is still uncertain. So where does that leave us? It leaves us where we've always been: deciding whether to insist that our financial advisors adhere to fiduciary standards is completely up to us. With or without a new rule we're free to choose the people who manage our money. If you don't know whether your banker, broker or advisor operates as a fiduciary, just ask. They're required to tell you. Typically, bankers and representatives at your neighborhood stock brokerage branch are not fiduciaries, while independent financial advisors often are. That's because independent advisors are generally compensated by fees you pay directly to them, plus they're not under pressure to sell investments in which their company has a direct interest. And because independent advisors are usually fee-based, they're much more likely to work with you closely to choose investments for your 401(k) and 403(b) accounts, even though they typically won't receive commissions from them. Does this mean that bankers and brokers are "bad" and that independent advisors are "good?" No, not at all. Many investment managers who are not fiduciaries do a fine job for their clients, recommending perfectly appropriate investments. But understanding the fiduciary relationship--or the absence of it--is a crucial part of financial literacy. It is important to know precisely where your interests stand vis a vis your advisor's interests, and to ask lots of questions if you notice that you're paying very high fees for your funds or that your advisor is recommending frequent changes to your portfolio. These can be red flags. No matter who manages our money the key thing to remember is that we are buying, they are selling, and we must conduct ourselves accordingly. One of the Retiree Association’s most vital benefits may also be its least visible. We advocate on behalf of retirees. We advocate especially with the senior leadership of American Red Cross. We meet annually with President and CEO Gail McGovern, and we have more frequent interactions with those who make decisions about pension and health care benefits, and who are in charge of the systems we depend on, such as the Benefits Service Center. We make sure that when decisions are made on any of these topics, the interests of Red Cross retirees are represented. Advocacy goes both ways. We also convey the viewpoints of American Red Cross to our members. We don’t do so mindlessly. We are separate from American Red Cross, and protect our independence. From time to time we will disagree with ARC. But most of us know from our own experience as employees, that most of the time Red Cross does the right thing for the right reasons. Especially when Red Cross finds itself in controversy, we make sure our members know the Red Cross side of the story. And not just because we support the mission of the American Red Cross and our former co-workers, but also because a strong American Red Cross can better support its retirees! Another area of high importance is educating out members about any topic that matters to retired people – health care, tax planning, money-saving opportunities, and more. We’ve been at this in an organized fashion for a while. But in this and future issues of our eNewsletter we’ll have an “In Your Corner” column that especially calls out our advocacy or educational activities. By the way, we have an energetic committee doing this work. But we could use a couple more members. If you’d like to be part of this effort, send a note to our administrator, Christie Phillips (admin@arcretireeassoc.org) and we’ll take it from there. If you haven’t signed up to PerkSpot you are missing out on discounts made available through Red Cross. Some are “Red Cross Exclusives” and other discounts change frequently. A weekly email provides a listing of all the new discount options. So, depending on what you are looking for you might find a great deal on exactly what you need. Follow the instructions below to set up your account. Recommend selecting “Subscribe to Weekly Perks”. AARP Foundation Online Tax FAQs Check the online list of frequently asked tax questions. You can also submit questions that will be answered by IRS certified volunteers. AARP Foundation Tax-Aide The nation's largest volunteer-run tax assistance and preparation service available to taxpayers with low and moderate income, with special attention to those age 60 and older. IRS: Free Tax Return Preparation for You by Volunteers The IRS Volunteer Income Tax Assistance Program (VITA) and the Tax Counseling for the Elderly (TCE) Programs offer free tax help for taxpayers who qualify. IRS: Seniors & Retirees Tips for Seniors in Preparing their Taxes. Check here for tips on common pitfalls for seniors to watch for when preparing their individual tax returns. If you are the beneficiary of a Red Cross retiree who passes away, what steps should you take? Contact the Red Cross Service Center at 1-877-860-7526 to report the retiree’s death. Have on hand the retiree’s full name, date of birth and last four digits of social security number. You will be assigned an Advocate to help assist with the process, answer any questions and the transitioning of any remaining benefits; pension, medical, dental and life insurance, if applicable. Once the Red Cross has this information, they will notify the various Red Cross insurance carriers. In addition to Red Cross, you need to contact holders of other assets: banks; bonds, stocks and certificates of deposit; other dividend income; IRAs. Make a complete list of these items, with account numbers, and name and phone numbers of individuals who manage these accounts. Property in your name, including real estate and vehicles, should also be on the list. If there are burial policies and a guardian has been appointed, notify them. Notify your financial adviser and lawyer. Note: First things first…for any of us, it’s a good idea to put these lists of assets, accounts, property, and contact information together ourselves, while we are living, and make sure to give copies to our beneficiaries, personal representatives or executors, and financial advisers. Also keep a copy of Red Cross Service Center information with your other financial papers. You will find this information and other helpful resources on the new retiree resources page on the web site. You can access the page by clicking here. To ARCRA members: Jenelle Eli, of American Red Cross International Services, spent more than three weeks on an International Federation vessel, that was transporting immigrants out of Libya. We encourage your attention to Ms. Eli's article and accompanying photos; they are especially compelling in light of current controversies surrounding immigration. Over the next hours, the moon dominates. Silence. Then, panic. This isn’t what any of them envisioned when they left Nigeria, Bangladesh, Syria, Mali. 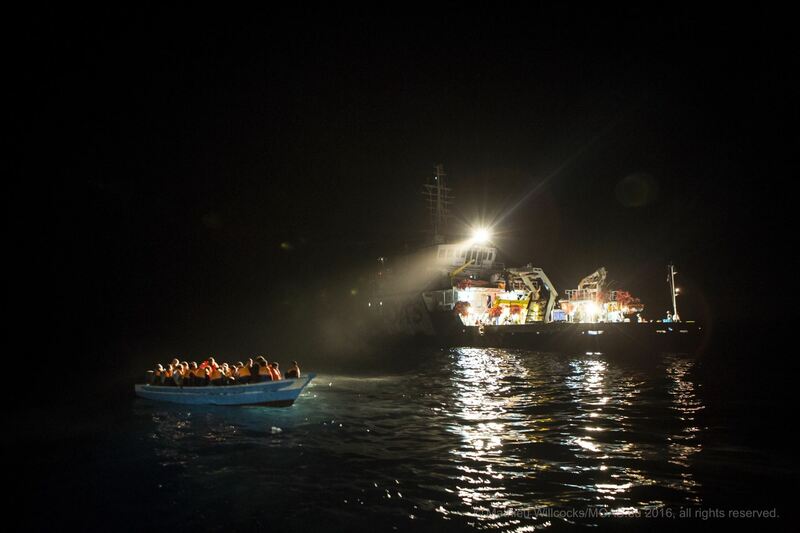 Some people will end up dying in the Mediterranean Sea (more than 3,600 so far this year). Others will be rescued. For the crew aboard the Responder rescue vessel — where I just lived for three and a half weeks — every hope and fear of the passengers is illuminated by a single search light. Once safely aboard the Responder, here are some of the things they told me: 200, 300 souls into wooden boats or rubber dinghies. Due north. "We are the lucky ones." There’s no dependable estimate for how many migrants perish in the Sahara Desert on their way to the Libyan coast, but that crossing may be even more dangerous than the Mediterranean. Many told me of starvation, dehydration, violence, and sexual assault in the desert. Once in Libya, nearly everyone I spoke with had been kidnapped and their families extorted for money. It’s practically a miracle they made it to the Libyan coast alive. ARCRA President Michael Carroll convened the ARCRA via conference call on January 25, 2017. The meeting began with the welcoming new Directors Ann Byrnes, Jack Campbell, Carolyn Kean and Armond Mascelli. We also welcomed Phil Hansen to the board. He will serve as Field Unit Manager, keeping the board abreast of Red Cross activities. Carroll conveyed his optimism that in 2017 ARCRA will continue to grow, become more efficient, and, most importantly, enhance the benefits that we provide to our members. The Board approved the 2017 budget as presented by Treasurer Jack Campbell and membership initiatives aimed at current and prospective members proposed by Membership Chair Jim Hamilton. Reports were received from key committee chairs including Bob Howard(Communications), Dave Therkelsen(Advocacy and Education), and Judy Hull(Technology). Stan Robertswill report on his efforts to promote volunteering by ARCRA members with the ARC at the April meeting; Programs and Services ChairArmond Mascelliwill also report on his committee’s review of theRetiree Connectionhotline and other programs/services we offer to members. It is our goal to share important information about committee activities in the monthly eNewsletters and on the ARCRA website.